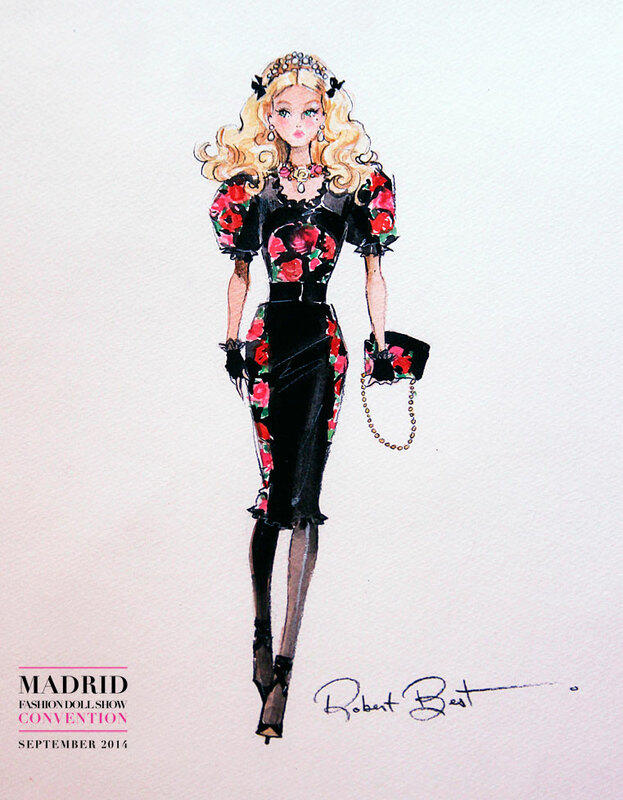 Barbie® doll wears a satin dress with a pattern of pink and red roses in full bloom. Short puff sleeves play against a tightly fitted waist, cinched with a shiny black vinyl belt. Sheer black organza panels bring a touch of cinematic intrigue. 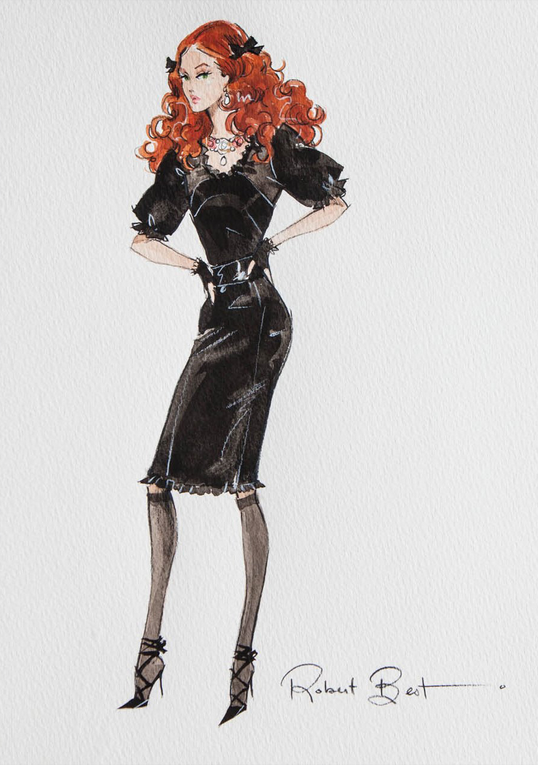 Knee-high stockings, fingerless gloves and whimsical hair bows are her dolce accessories. Completing the rose motif, three delicately carved roses on black satin ribbon form her lovely choker necklace. Convention doll for the Paris Fashion Doll Festival & Japanse Convention. 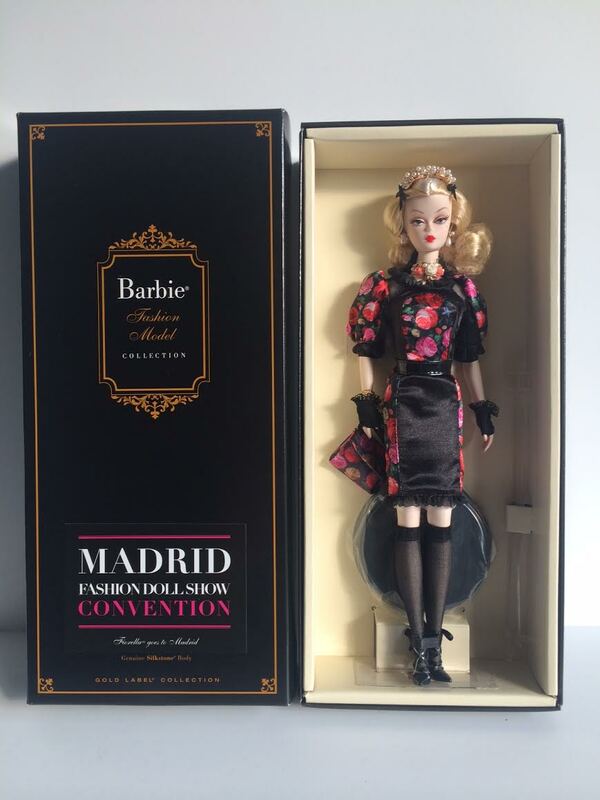 Convention doll from the Madrid Fashion Doll Convention. 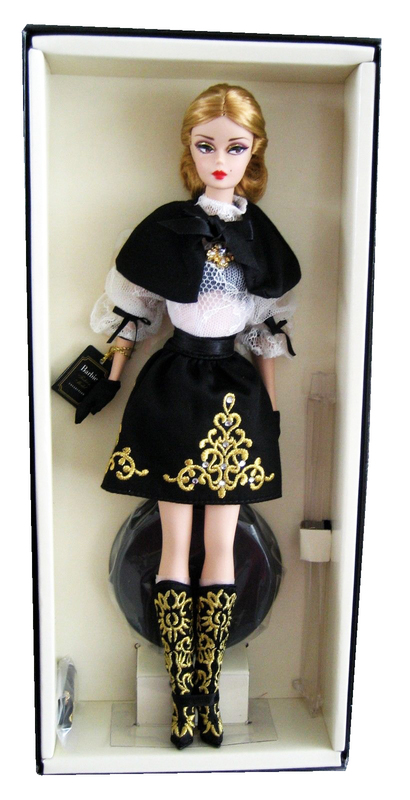 This variation of the Fiorella doll has a matching handbag, headpiece inspired by Dolce & Gabbana and red lips. Ciao, Italia! Sweet and beautiful, yet exceedingly elegant, this bella donna is completely engaging. Inspired by classic Italian neorealist films, Dulcissima™ Barbie® doll wears a short black A-line skirt and matching cape tied with a satin ribbon bow. Elaborate golden embroidery embellishes the skirt, baguette purse, and tall boots. A lacy off-white blouse decorated with black bows completes this dramatic ensemble. The final perfect touches include golden brooch and elegant black gloves. Convention doll from the Italian Doll Convention. This Italian beauty wears a brocade jacket with puffed sleeves and sparkling rhinestone buttons worn over a sleeveless mermaid–hem dress. Includes gloves and booties. Genuine Silkstone© body. Bravo beauty! Wedding dress features sequined silvery embroidery, capped sleeves and tea length skirt lined in organza and worn over a petticoat. Includes gloves, bouquet and “book.” Genuine Silkstone© body. 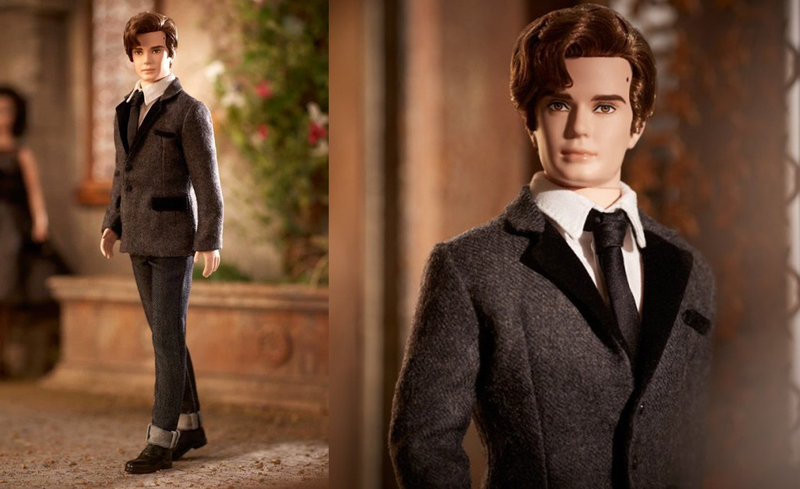 The epitome of exquisite black tie, Tailored Tuxedo Ken® doll wears a sophisticated classic tuxedo. 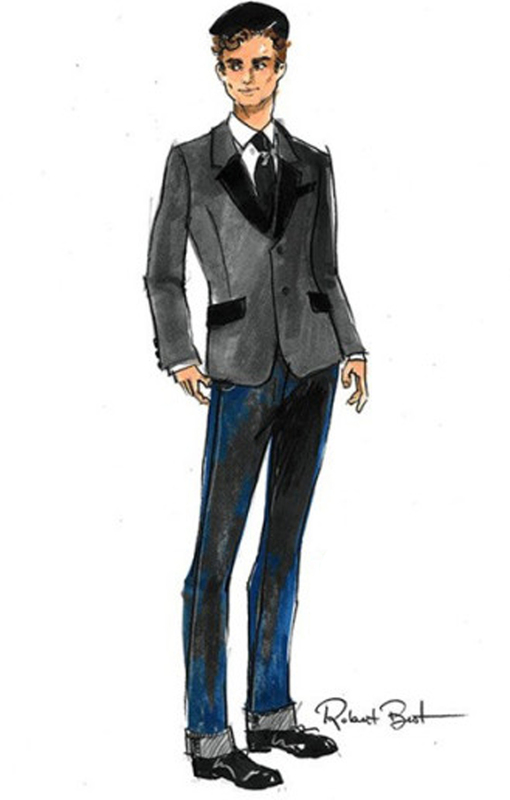 The beautifully tailored, single-breasted jacket features stylish peak lapels and a single vent. His crisp white shirt is worn with a white satin bow tie and a vest.